Drumroll please…you made it to THE FINAL assignment of the Organize & Refine Your Home Challenge! December is Organize Your Finances Month here in the Challenge. Last week’s assignment was to complete an yearly review to get an overall picture of your financial situation as you head into the new year. This week, we’re going to zero in on how to organize bills. I loathe the idea of having to pay interest, penalties, or late fees associated with lost bills and delinquent payments. Having an organized system for tracking and paying bills will save you money by avoiding these unnecessary expenses. Reducing the number of bills that you have to manage each month has several added benefits. It reduces the possibility of a bill getting lost or slipping through the cracks somehow (which could result in late fees). In addition, you might be able to better capitalize on a particular reward program if all of your debt is consolidated into one account. Have one place in your home where all incoming paper bills will live. 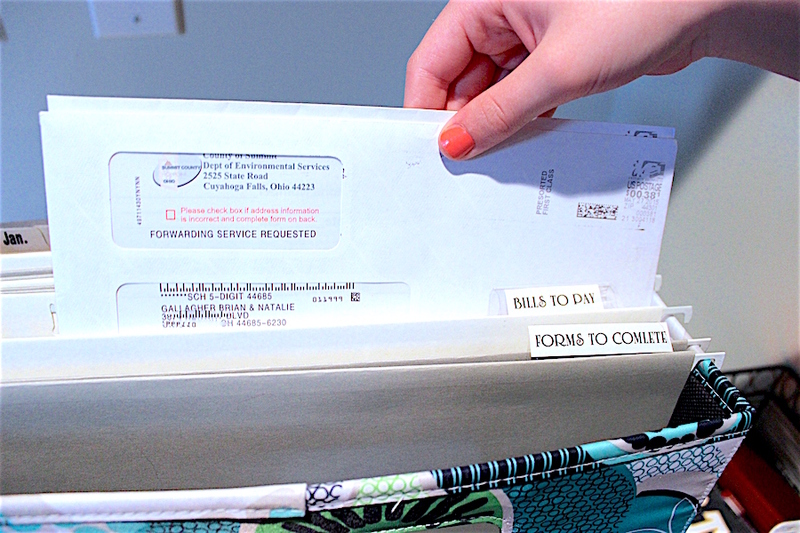 When I process my mail each day, I place bills in the “Bills to Pay” folder of my action file system . Make sure your bill home is portable if you typically complete bill paying tasks elsewhere in your home. For bills that you receive electronically via email, create a folder within your email client for incoming bills to be stored. For bills that are set up on automatic payment – file any incoming electronic bill statements into a reference folder within your email system (call it something like MONHLY BILLING STATEMENTS). You’re simply filing them away as reference, since they do not require any action on your part. For bills that you need to manually pay – set up a folder to file incoming bills to be paid in within your email system (call it BILLS TO BE PAID or something similar). Take advantage of filtering features that your email client offers to automatically divert those incoming bills to your BILLS TO BE PAID folder as they arrive in your inbox. In order to avoid late payments, make it a habit to review and pay bills weekly at a regularly-scheduled time. For me, bill paying is part of my weekly paper admin appointment. During this appointment, pay both your paper bills as well as your electronic bills in your BILLS TO BE PAID email folder. 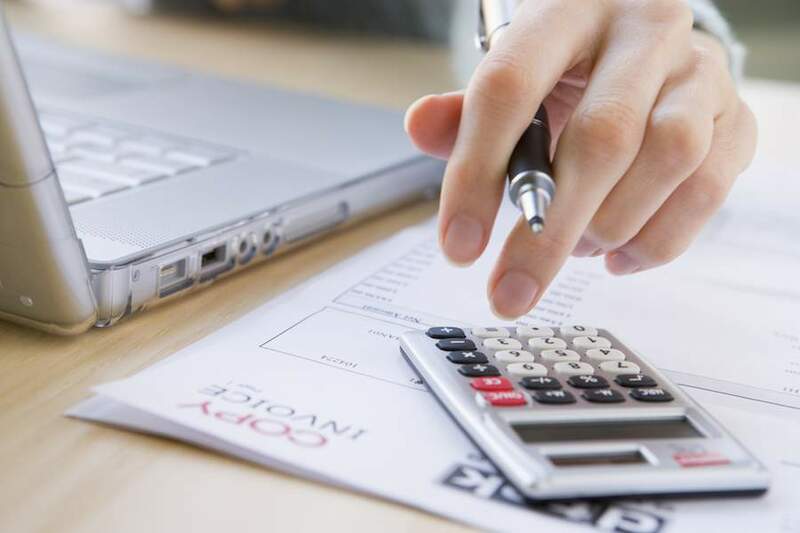 Paper bills – you can either shred the bill once it’s paid, or file it away with your tax documents if you need to keep it as part of this year’s tax documentation. Electronic bills – once the bill is paid, move the bill statement from the BILLS TO BE PAID email folder to a folder PAID BILLS folder within your email system. As part of my weekly bill paying session, I like to keep track of which bills have been paid so far this month, and which bills will be coming down the pike. Having this information on hand helps me to make sure I have enough money in my account to cover upcoming bills as they come due. Another benefit of regular bill tracking is that I can easily determine if a bill is missing for some reason. I’ve created a set of bill tracking printables to make this step easier. 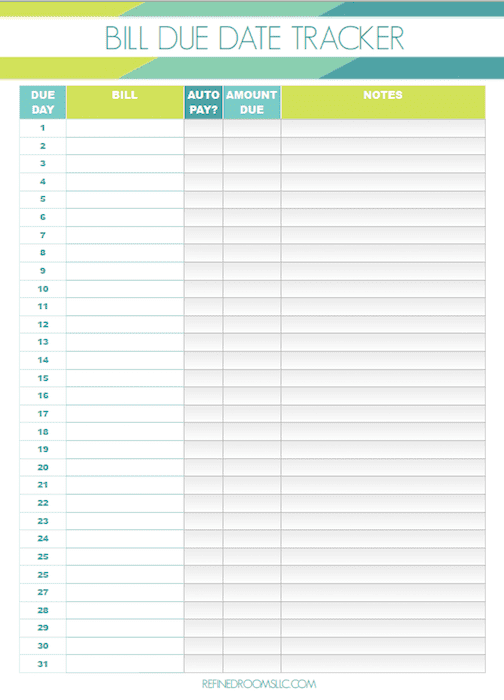 Download and print the Bill Due Date Tracker printable. Gather last month’s billing statements and record each bill on the day of the month it’s due. For bills that have a fixed payment amount, record that figure in the AMOUNT DUE column. Put a check mark in the AUTO PAY column if you’ve set the bill up to be paid automatically. Next, print out a copy of the Monthly Bill Payment Checklist. 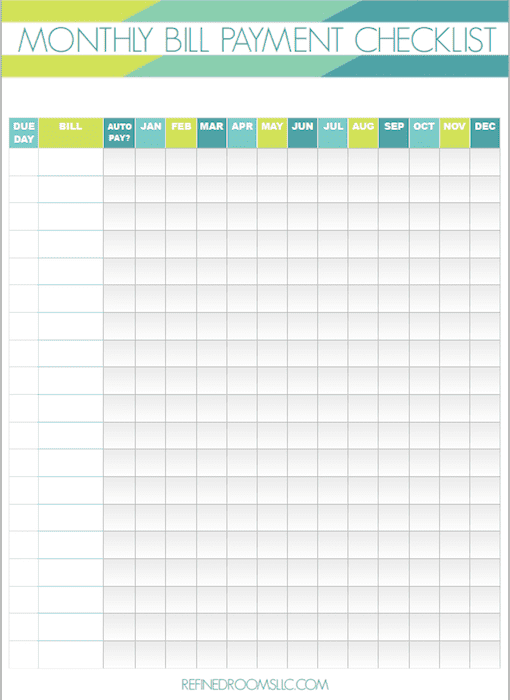 Using the Bill Due Date Tracker as a guide, write down all of your bills in order of when they’re due each month and record the due day in the appropriate column. Put a check mark by any bills that are paid via automatic payment. Simply check off when a particular bill is paid each month. The Monthly Bill Payment Checklist allows you to see at a glance if there’s a bill that you’ve forgotten or haven’t paid. It’s a super easy system for organizing your bills! All you have to do is subscribe to my email newsletter and you’ll gain instant access to my Resource Library (which includes all of these printables + so much more!). Great article and very nice looking printables! It is so easy to forget paying bills on time and create a mess.